Wags – Professional Dog Grooming in Waterlooville. From a full groom to a wash and brush up your pooch will be pampered. 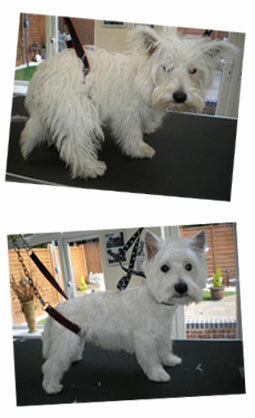 Wags Wash and Dog Groom is your safe and friendly dog grooming service based in Waterlooville, Hampshire. Whilst your dog is with me you can rest assured that he or she will be cared for in a safe and stress free environment. During their grooming and whilst with me, I will always treat your dog as I would treat my own – with the love and one to one attention that they deserve, no cages are ever used. Most breeds of dog are welcomed for grooming and will be groomed to breed standard or, if you prefer something different then I am more than happy to work to your wishes. I can work all hours and all days, you will find that I am very flexible and will work a day and time to suit you – PLUS I even offer a collection and drop off service from in and around the Waterlooville area. Before starting work on your dog, I will always offer a Free quotation so you know exactly where you stand. Been for a muddy walk? Does your dog need an emergency clean up? No problem just ‘Contact Us’ and I will help.